Yvonne Push-UP Exercise Stands, 360-degree Rotation Soft Grips Handle Power Round Arm Strength Exercise Fitness Equipment Push-ups Frame for Fitness Workouts at Home or Gym. we want you to get the most out of your workout. The most muscle for your pushup, if you will. That's why we think that the push-up bar is an absolute essential for your home-gym workout. Push-ups done with a twist. 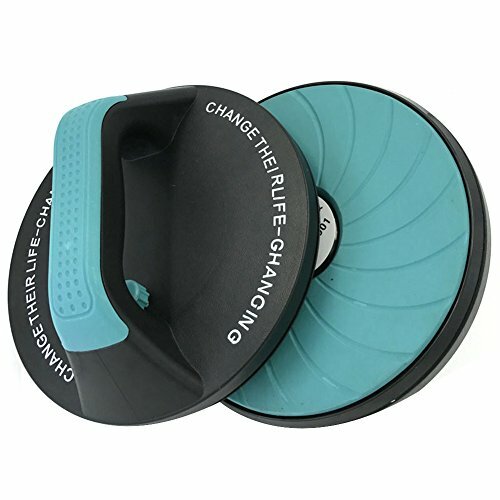 Adjust the handles from stationary to rotating with a simple clicking mechanism conveniently located near the handle grips, and challenge yourself to the rotating push-up. The rotating action engages your shoulders, chest and triceps, and tones your muscles better with the twisting action. 【HIGH INTENSITY PUSH-UPS】Amplify your workout to the next level and increase definition in your arms, shoulders, chest, triceps and abs. Muscles, engaged. 【ROTATING HANDLES】If you're looking to switch things up you're your usual workout and challenge yourself, the rotating action makes your push-up more intense, and engages more core muscles. 【LESS STRAIN ON YOUR WRISTS】The easy-to-grip handles distributes your body weight evenly, reducing pressure and strain on your wrists by positioning your body at a neutral stance. No more awkward wrist twitching for you. 【LIGHT AND PORTABLE】So you can always squeeze in a workout wherever you go, from the office to your hotel room. 【NON-SLIP, STABLE BASE】The non-slip rubber base securely grips well on all floor surfaces, so you definitely won't fall flat on your face mid way through your push-up. If you have any questions about this product by Yvonne, contact us by completing and submitting the form below. If you are looking for a specif part number, please include it with your message. Pair Of Pushup Handles Stand Bars GYM Exercise For Men Women.Best Selling Workout Home Training Item.Strength Fitness Build Muscles & Good Health.Portable Steel & Easy to Use.! !